The Finance Department is located at City Hall within the City Administration Office. The department is responsible for all of the City’s financial transactions including revenue and expenses as well as payroll. 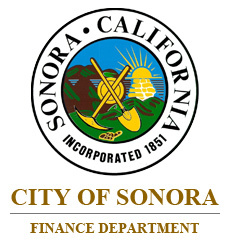 The City of Sonora ’s governmental activities include police and fire protection, public works, community development (building and planning), grants and special programs and general government. Sales tax, property tax, vehicle license fees, transient occupancy tax, user fees, and franchise fees finance these activities.